In early 2017, LL Bean rolled back their infamous return policy to be just a little less generous. They were known for their ludicrous satisfaction guarantee policy that once saw a family return 20 year old clothes from their grandfather’s attic in exchange for a $350 gift card. After seeing their policy abused too many times, LL Bean now offers a much more reasonable 1 year satisfaction guarantee – still one of the most generous on the market. Designing a reasonable return policy is a critical part of your business strategy, as overly relaxed return policies can potentially cost you money. Customers returned $351 billion of all purchases — brick-and-mortar and online — in 2017, according to the National Retail Federation. That’s about 10%. Return rates jump to about 30% or higher when looking at just online purchases. For example, Revolve, the popular online clothing seller, made $400 million in net sales in 2017, but paid out an almost equal amount, $385 million, for returns, writes Recode’s Jason Del Rey. That doesn’t include the cost of return shipping. It can be tempting to try and eliminate returns altogether by making customers jump through hoops. However, customers aren’t likely to trust an online retailer that doesn’t offer an easy way to return purchases that don’t fit, arrive damaged or just aren’t quite what they expected. If customers are hesitant about a purchase, they want to know that your brand won’t make returning something difficult. Great refund policies encourage customers to commit to a purchase and allow them to shop without fear of consequence. A solid ecommerce return policy can make or break a sale or turn a visitor into a customer for life. A clear returns, refunds and exchanges policy shows that you, the ecommerce business owner, stand by your product, and pride yourself on a stellar customer service experience. Providing a comprehensive policy for returns and exchanges instills confidence in you, your business and your products. And trust has a huge impact on your bottom line. One study featured in the Journal of Marketing found that customers who received free shipping on returns increased their purchases over the next two years by 58 to 357%. How to roll out your policy. How to remain competitive as a small business. Developing a comprehensive plan can actually reduce the resources you spend on returns and keep your customers coming back. Even though the customer may not be satisfied with their original purchase, handling the return professionally will ensure their continued patronage. Cool – but how exactly do you write that returns policy? Let’s dive in. When it comes to updating or even adding a returns policy to your site, there are a few best practices to abide by. We’ll outline these below, but we’ve also included some additional tips and tactics on what to include. This is a potential differentiation factor between you and your competitors. Be sure you offer the better customer service experience from beginning to end, starting by ensuring they know your policy and ending by living up to your customer’s expectations of your promise. 1. Don’t hide your policy. You customers should never have to go on a scavenger hunt to find information on your store. Keep this in broad daylight on your main menu. Or, if you’re comfortable, shout it from the rooftops by placing it in places like your carousel and banners throughout your store. But, the best place to put an ecommerce return policy is in your confirmation emails on purchases. Let those who have already bought know that you are dedicated to them liking their product, and that if they don’t – they can always return it. Being your customer’s biggest advocate is a great way to foster lifetime loyalty. 2. Never (ever, ever, ever) copy and paste. This goes for nearly anything on your site (especially product descriptions), but a returns and exchange policy is not a one-size-fits-all scenario. Personalize it to your specific business and target audience. Make this a fun page to read and reiterate your commitment to your customers. Include, if possible, customer reviews of the experience as well. Use this page as a testimonial spot on your site – one that you can use to prove to potential customers that not only do people love your products, but that even when they don’t, you still treat everyone with respect, dignity and fairness. Yes, you want to talk to your target audience, but avoid using words that send people running for a dictionary. You don’t want to confuse anyone – especially those Google bots that can help boost your SEO. Use keywords. Reiterate your promise. Incorporate real customer feedback. 4. Avoid the scary stuff. Long story short, make your returns process easy. In fact, your returns process should be just as easy as it was to buy the item in the first place. Don’t offload the issue on the customer. 5. Outline what they can expect from you. Do you exchange, offer store credit or return their money? Every merchant has their own preference, and you shouldn’t feel pressured to offer only a full refund. Determine what works best for your unique business. You can even A/B test here to see which offerings your customers prefer. 6. Set expectations for your customer. Don’t leave your customers confused. What’s the procedure for a return or exchange? Does the customer need to use your packaging or can they use their own? Do they need to include the order slip? Is there a limited time in which a return or exchange can be completed? Outline the specific process and guidelines. Make your ecommerce shipping policy and returns understandable and straightforward. Make sure all employees are up to date with your return policy and procedures so they can assist customers quickly and effectively. 8. Be prepared to eat the cost of your mistakes. If you messed up, be honest and make it right. If you shipped the wrong item, or packaged it poorly, you should be willing to make it right no matter what the official policy is. We all make mistakes, it’s how you handle those mistakes that matters. Finally, don’t forget to play fair. If you make a change to your policy, be sure to honor the old policy if an order was placed before the change took place. A good return policy doesn’t just reassure your customers. Writing and displaying a clear policy also reduces the time spent processing returns, meaning it’s great for your staff too! So how can you offer a return and exchange policy that drives sales and increases customer loyalty – but doesn’t give away the farm? We’ve got 10 tips and real-life examples to help you create a return policy that builds trust and make customers for life. The first step of writing a great refund policy is to stop thinking about returns solely as money lost. The return in investment is much more than just the lost value of products returned. Having an easy to understand – and easy to utilize – return policy will bring in more sales. More than half of online shoppers say that they avoid stores with a strict return policy. “Our best customers have the highest returns rates, but they are also the ones that spend the most money with us and are our most profitable customers,” says Zappos’ CEO Craig Adkins. In 2017, Narvar, a post-purchase experience platform found that of the 60% of online shoppers that make at least one return or exchange per year, 95% will make another purchase if the return experience was easy for them. Surprisingly, customers that have a poor experience that’s handled well end up more loyal than they were in the first place. Giving customers hassle when they are trying to return something is more likely to deter them from shopping with you again, rather than deter them from the return. 2. Keep it easy to understand. Don’t use complicated legal jargon. 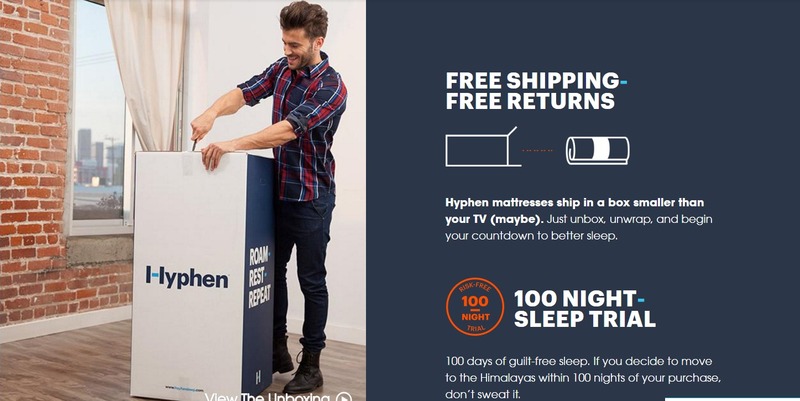 Hyphen Mattress, a trendy online mattress seller, sticks to their friendly brand voice throughout their return policy. Note their avoidance of complicated wording or limitations on the return. Man Crates keeps it simple and on brand with their refund policy. It’s not about shipping costs, RMAs or exclusions. Just call them and they will “make it right,” which is all your customers care about. When writing return and refund policies, your brand’s goal is to aim for clarity. Your customers are busy individuals with jam-packed schedules. They don’t have time to decipher convoluted text. Make their lives easier by writing return and refund policies in simple language. Try using short, straightforward sentences and breaking the policies into chronological steps. In the end, your brand will earn more respect from your customers. 3. Make it easy to find. 63% of online shoppers check your refund policy before purchasing. To make the shopping experience for these customers as easy as possible, don’t make your policies difficult to find by hiding them away. A good refund policy influences purchase decisions, especially if customers aren’t 100% sure at the checkout. At the very least, a return policy should be included in the main menu of your site. If you have a particularly awesome return policy, advertise it proudly on your homepage. Some might be concerned that advertising a refund policy might encourage more returns. Would you rather your customers keep a product they didn’t love, or would you rather have a happy customer with an exchange? A surprising 60% of millennials have admitted to keeping a purchase they weren’t happy with because of a difficult return policy. Forcing customers to hang on to purchases they don’t want isn’t a great way to build loyalty. Communicating your refund policy, both before and after a sale ensures that you don’t have those silent, unhappy customers lurking in your reviews section. Instead you get to proactively make their day. Shopping for shoes online always includes a bit of uncertainty, especially around fit. Lems Shoes knows that customers might be concerned about being stuck with a poor fitting pair of shoes, and makes them feel comfortable about returns immediately upon landing on their homepage. This guarantee builds trust with their customers and reassures shoppers that they won’t be stuck with an item they don’t like. Don’t be afraid to make a bold promise and to write your policies like real human-beings and not lawyers. Saying something like ‘We stand by our product and offer a 60-day money-back guarantee, no questions asked.’ is easy to understand and can be applied to your marketing. 4. Be upfront about all of the conditions and set expectations. If there’s something your customer needs to know about returning products, make sure it’s included in the policy upfront. Do they need to return it in original packaging? Does it need to be in the original condition, or is wear and tear acceptable? How do customers access the return label? Will the funds be deposited into their PayPal account (or other gateway)? MEE Audio sets clear timelines for when the refund occurs and even breaks down why a customer might see a delay in getting their money back. It’s much better to underpromise and overdeliver. If they beat their four-week refund timeline, customers would be much happier than if they originally expected to get a refund in a week, and ended up waiting three. 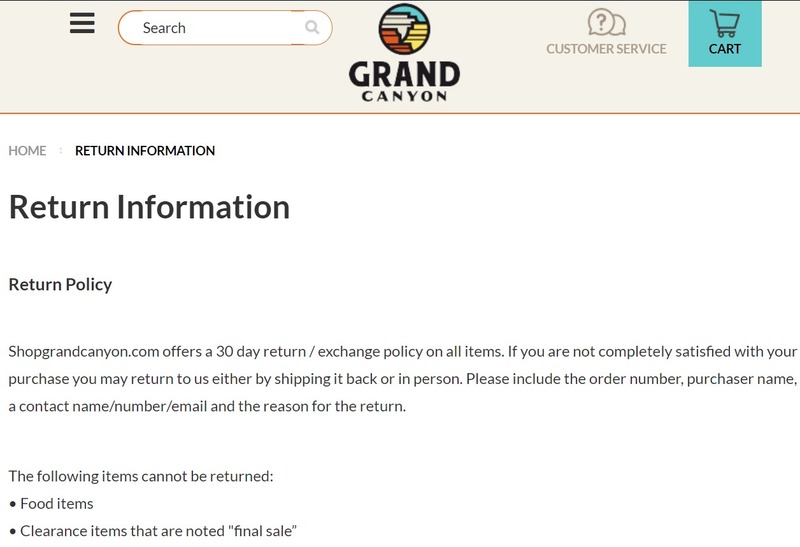 Grand Canyon has a fair return policy but says upfront that food and final sale items can’t be returned. This sets the right expectations for customers so they aren’t surprised when trying to return something. Need to have a stricter return policy? That’s cool. Again, just be clear. 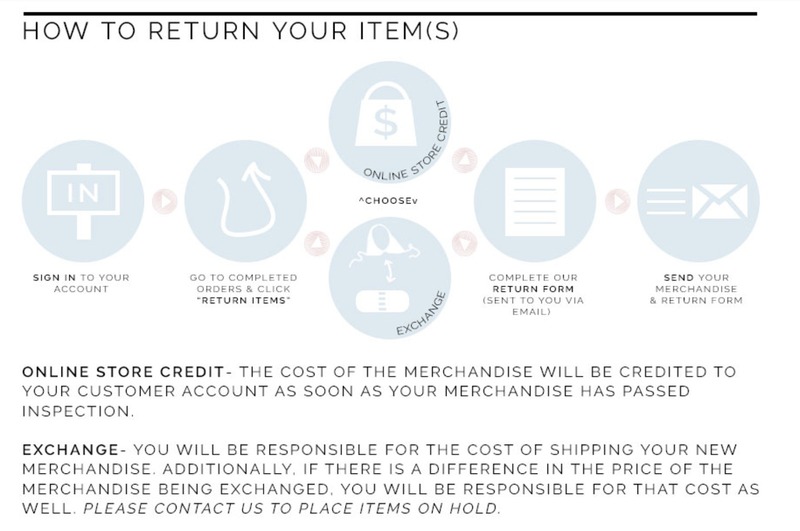 San Lorenzo Bikini does this extremely well on their Return Policy page, using design and clear language to communicate their policy. Keep it simple. No one should need legal assistance to understand your return and refund policy. As best practice, ask yourself if you’d be comfortable or willing to go through your own refund procedure if you had a serious issue with a product or a legitimate reason why you needed an exchange. If the answer is no, it’s time to reconsider your approach and create a better customer experience. 5. Give them enough time. It’s common to limit return and exchange periods following a purchase in order to prevent old merchandise from being returned late, like LL Bean’s new policy. If you’re buying gifts, or have a busy week when your order arrives, 14 days might not be enough to time to make a decision on a return. By not rushing the return, customers will feel more at ease making the purchase. For example, a mattress is an extremely personal decision to make. A good night’s sleep can have a big effect on your life. So imagine the concerns with ordering a mattress online without even trying it once. That concern is why Hyphen offers such a comprehensive return policy. Not only are returns free, you can also return it after you’ve slept on it for 100 nights. They are so sure you’ll love their product, they’ve made a big gesture to build customer trust and encourage sales. Return periods are particularly troublesome during the holidays. Take this story about a woman who bought her father a train set for Christmas. It needed to be exchanged due to a defective power switch, but because she had purchased it early in December, the refund period had passed. It’s not practical to expect gift buyers to open and test their presents prior to giving them. To combat holiday returns, Cases.com offers an extended return period through January 15th. It’s the headline on every single one of their pages. Gift givers can shop with abandon, knowing that any gifts that don’t quite hit the mark can be returned even in the new year. Be as liberal as possible with your returns policy. Return windows are becoming more important to consumers, and they have an increasingly large choice of places to buy. 6. Consider offering free returns. Returning a purchase is never a fun experience – but being asked to pay for shipping and a restocking fee can make it hurt even more. Customers are more likely to purchase an item they aren’t sure about if they know they can return it free of charge. This is especially true for bigger price tags. If at all possible, eliminate restocking fees and be upfront about shipping charges on returns. Work out what each option you are considering will actually cost your business. Don’t just do what everyone else is doing. 7. Help customers help themselves. Providing options for customers to arrange their own return or exchange saves them time, and it’s cheaper than staffing front line representatives to process the refund. It also reassures customers that they won’t need to jump through hoops, or argue with agents to get their money back. There’s a few tools that can make it really easy to offer self-serve returns and exchanges. If you’re using a platform like BigCommerce, customers can log-in and request a return authorization form (RMA) without needing to talk to customer service. AfterShip’s returns platform allows customers to upload images of a defective product for your team to review before approving a refund, and lets customers print their own return labels for shipping. Returns and refunds policies should be put through CHILD TEST. If you were to read the policy to a child, would they understand it? If not, it’s too complicated. You may think you’re helping yourself by making it difficult for people to submit returns, that you are saving money, but all you’re really doing is creating a higher likelihood that you frustrate your customers. 8. Think “effortless” and low effort. The biggest cause of customer disloyalty is a high effort experience. A remarkable 96% of customers reporting high-effort experiences do not become repeat purchasers, compared with only 9% of those with low-effort experiences. This applies across their entire lifecycle, from browsing to checkout, shipping to returns. Keeping returns a low effort experience keeps customers coming back in the future. RedsBaby sells strollers and other baby accessories online, something that could be very bulky and difficult to return. That’s why they offer a concierge return service for a small price. Simply email their support team and you’ll never need to think about the return again. If you look at the process, it’s just two steps and they take care of the shipping. First, let them know about the return, then arrange a time for the pickup. With exchanges that easy, why not buy and try-on the whole store? Keeping customers informed on the status of their return is also important to an effortless experience. Let them know (or provide tracking numbers) when their item has made it back to you, when the refund has been processed, or the replacement sent out. It’s important to keep your returns and refunds policies simple. Customers do not want to jump through hoops if something doesn’t work out for them. It should be just as easy to return an item or get a refund, as it was to purchase. 9. Offer alternatives to a full refund. A return doesn’t always need to mean a full refund. Offering alternatives is a great way to be cost efficient and make sure your customers stay happy. An exchange is better than store credit, because your customers will have what they need. A store credit is better than a refund, because it keeps the money locked to your store. If you are offering alternatives other than a full refund, train your front line staff on when (and how) to offer each alternative. They’ll need to be proactive about reducing refund costs while still ensuring the customer is happy. San Lorenzo only offers exchanges or store credit as well. They even detail exactly how to do it. I see a lot of brands that jump into an aggressive refund policy (for the customer), and get seriously burnt on the backend. Instead, brands need to seriously consider costs, or at least run a test, before going beyond a 1-month, no-questions-asked policy. Use alternatives! 10. Make sure it makes sense for you. Not all companies will be able to offer a 100% guarantee right off the bat. It just wouldn’t be financially feasible to do so. Only you can crunch the numbers and see at what point the additional sales from a strong refund policy balances the lost revenue from refunds. Dinovite offers a return policy very unique to their product. They encourage customers not to take advantage of their guarantee until a full 90 days after purchase, because it takes that long for pet owners to see the full benefits of the product. A 14 day return policy just wouldn’t be prudent for them. Remember, your policy isn’t set in stone. You could offer a one month promotion with free returns and see how it goes. Just remember that if the policy does change, you’ll need to honor whatever was promised when the customer made their purchase. We like to be generally conservative on the written return and refund policies, but we extend return times for holiday orders. We give our holiday customer support staff a lot of leeway to “make things right” for the holiday shopper, despite the policies. Hopefully we’ve provided you with enough examples and tips to get your brain juice flowing on how you can build and improve your own refund policy to drive sales. Make it easy for customers to find and understand your return policies. Eliminate barriers for customers who need to make a return. Consider the benefits that come from a customer-first return policy, as well as the costs. Want to learn how to reduce returns with a digital advisor? Check out this guide! 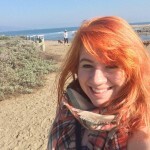 Sarah Chambers is a serial customer experience leader, most recently with Kayako as Director of Support. Currently, she's the founder and manager of Supported Content, a B2B content agency that's dedicated to creating helpful content for the best companies in the world. When not writing, she's climbing in Turkey, snowboarding in Austria and eating all the cheese she can get her hands on.